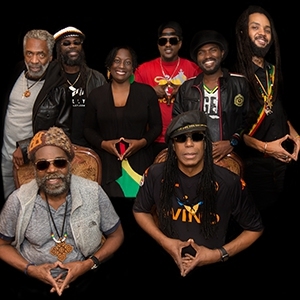 The legendary Wailers band returns to bring its revolutionary sound to fans around the world.Steered by famed bassist and founder Aston "Familyman" Barrett, and joined in solidarity with original Wailers' guitarists Julian Junior Marvin and Donald Kinsey, The Wailers continue to make musical history. From 1973 to 1980, Bob Marley & The Wailers recorded, toured, and performed before countless millions worldwide. Since 1981, Familyman and Junior have carried on the mission to "keep The Wailers together," just as Bob requested, affirming: "By doing that, you keep me alive through the music." In tribute to the late co-founder and drummer Carlton "Carly" Barrett, The Wailers present Aston Barrett, Jr. on drums. It's startling how this young powerhouse delivers with his uncle's inspiring landmark style. Lead singer Joshua David Barrett is a Rastaman by lifestyle and culture. Josh delivers Bob's powerful message of Jah love and unity through his performance and interaction with the audience. Also on stage are singers Shema McGregor, daughter of I Three Judy Mowatt, and Hassanah, a multi-cultural powerhouse; veteran Owen "Dreadie" Reid on guitar/bass; and Javaughn Bond on keyboards. The performance anchor is live engineer Dennis Thompson, the man responsible for The Wailers sound in stadiums, clubs, and studios throughout the '70s. There are more than 250 million Bob Marley & The Wailers recordings sold, including 1977's Exodus, anointed Best Album of the Century in 1999 by Time Magazine, and "One Love," named Song of the Millennium that same year by BBC. Spin Magazine listed Bob Marley & The Wailers at #4 of the "50 Greatest Bands of All Times," while The New York Times named Bob Marley the most significant musician of the 20th century. These accolades were made possible by the creative, timeless, and distinctive music, lyrics and production of these incomparable Wailers musicians.